Kansas State was all kinds of good this past week. So was Texas, TCU and Texas Tech. Kansas? They’ve got problems. And it’s the usual for West Virginia and Oklahoma State (except the Cowboys had one bright spot) in this week’s Big 12 Basketball Good, Bad and Ugly. Kansas State had an enormous week, and I won’t write much here because, we’ll, I’ve written about it all week. First, the Wildcats took care of Kansas at home for just the fifth time at Bramlage Coliseum. 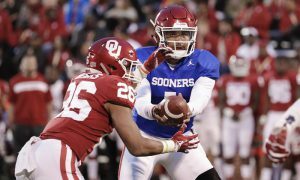 The article explains the woes the Wildcats have had against the Jayhawks and just how big that win was, historically. 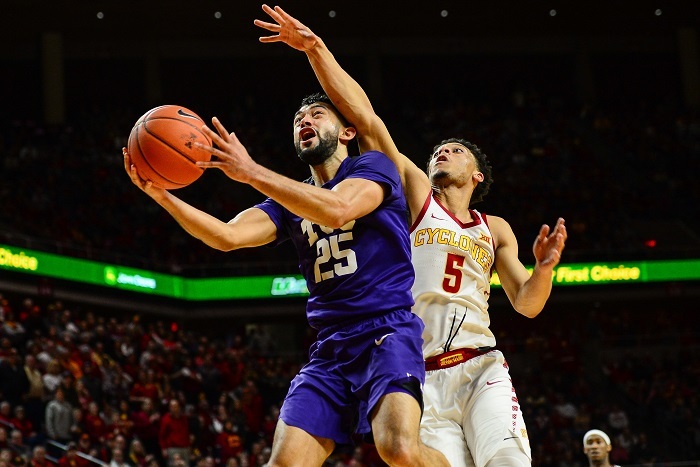 Then, on Saturday, I covered K-State’s win over Baylor, one that provided them a two-game lead over the rest of the Big 12 with eight games to play. If Kansas’ streak of 14 straight regular-season league titles is going to end, well, Kansas State is in the driver’s seat. While the Wildcats have the “one game at a time attitude,” I would imagine they wouldn’t mind matching that 11-game league winning streak the 1974 team put together in the Big 8. Kansas State is three games away from that heading into their game with Texas on Tuesday. If you read Good, Bad and Ugly each week you I do an honor roll at the end of the top performers of the week. I do this to help me do my Starting 5 article. Well this week there were some great performances and, in some cases, some double-appearances that I thought were cool because they didn’t come in the points department. For instance, Texas Tech forward Norense Odiase had double-digit rebounds in both of Texas Tech’s wins this past week. Derek Culver of West Virginia did the same thing in two losses. Kansas State’s Barry Brown Jr. had two games of five or more assists. So did Texas guard Matt Coleman III, Oklahoma State guard Isaak Likekele and TCU’s Alex Robinson (he also managed a double-double with 10 points and 11 assists against OSU). TCU’s Kevin Samuel had four or more blocks in both games, and Texas Tech’s Matt Mooney had four steals in both of the Red Raiders’ games. It’s never just about the points and the dunks in college basketball. You need performances like these, too. I don’t know what to make of Texas. One week they’re sitting on the NCAA Tournament bubble. The next week they beat Baylor at home with one of their best shooting nights of the season and then travel to Morgantown and avoid the trap game by trouncing the Mountaineers. Will the real Texas please stand up? Wait, what if this IS the real Texas? Gosh I’m so confused. Hey they had a great week. Let’s leave it at that. The Oklahoma State Cowboys are dying for an inside presence. They’ve been hoping that could be Yor Anei, and he’s starting to show it. Going into the TCU game on Wednesday he had averaged 8.8 points per game in the past five games. Against TCU he put up a career-high 20 points. That’s great news for head coach Mike Boynton Jr., who needs any bright spot he can get his hands on. Anei scored 8 points against Kansas on Saturday, so at least he met his average. The Cowboys’ season is pretty much done in terms of postseason beyond the Big 12. But any development of any of the Cowboys’ young players is a positive. pass to Desmond Bane, which Bane turned into a 3-pointer. We should also note that Bane became a member of TCU’s 1,000-point club during his 26-point game against Oklahoma State. The Oklahoma State-TCU game turned into one of the best games of the week, and it had a fantastic ending, authored by JD Miller. 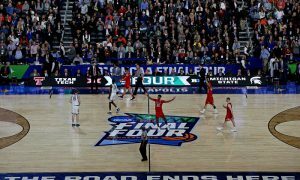 His handing teardrop in the final seconds sent the Horned Frogs to a buzzer-beating win, and apparently that momentum carried over to their trip to Ames, Iowa, where they scored 92 points and beat Iowa State on the road in the capper on a 2-0 week they Horned Frogs desperately needed to bolster their NCAA Tournament hopes. OK, so a lot of TCU this week. Not planned. Sometimes that’s just how it works. 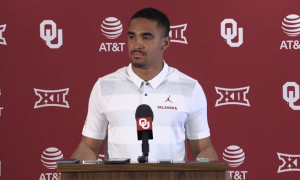 I think we knew players like Oklahoma’s Trae Young and Kansas’ Devonte Graham were headed to the NBA after last season. But some weren’t sure about TCU guard Kenrich Williams, who could play four different positions for the Horned Frogs. Would his versatility be valued at the next level? Would he get a chance? Well, the New Orleans Pelicans have opened the door for him. Iowa State and Texas Tech stayed in the Big 12 race this week, though Iowa State hurt itself a bit with its loss to TCU. But they’re still within spitting distance of the Kansas State Wildcats and they meet K-State next weekend. If ISU is going to win that game and keep this race tight, the Cyclones need clutch shots like this from players like Marial Shayok. As for Texas Tech, its 2-0 week allows them to stay within range of K-State, just two games back. But they don’t get a rematch with the Wildcats. They’ve already played their two games and they split the series. So the Red Raiders are relying on someone else to do their dirty work for them down the stretch. 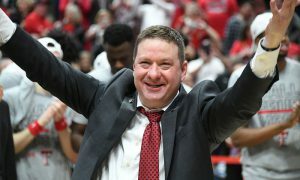 Chris Beard and the boys from Lubbock desperately need to hold serve. The loss in the Sunflower Showdown was bad enough for Kansas. But on Thursday night we learned that guard Lagerald Vick was taking a leave of absence from the program. According to the Kansas City Star, the absence could be up to two weeks, but there’s no actual timetable for Vick to return to Lawrence. Head coach Bill Self expects him to return. Vick is the Jayhawks’ best 3-point shooter and with Kansas’ depth depleted already by injuries and suspensions, losing Vick now is another huge blow to the Jayhawks. Kansas reacted well by beating Oklahoma State. But, frankly, Kansas should have won that game without Vick. Bigger games are ahead and they’ll miss Vick’s shooting. Losing Vick comes on the heels of this. Brutal. But seriously, I’m hoping the issues that have called Vick home are not serious. Just a week ago Baylor was the Big 12 darling and things have turned fast. First, Baylor lost to Texas. Then Baylor lost to Kansas State and did so without guards Makai Mason and King McClure, both of which were injured. They were on the bench for Saturday’s loss and Mason’s right leg was in a brace. It’s unclear if either will be back for Monday’s game with Oklahoma. In fact, Baylor basically had a starting lineup in street clothes, when you consider guard Jake Lindsey and forward Tristan Clark, who are out for the season. To say Bears head coach Scott Drew is frustrated is an understatement. The Bears still played Kansas State tough on Saturday. But can this depleted bunch beat Oklahoma? 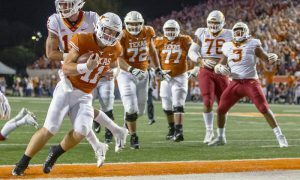 Whether it can or not may determine whether the Bears can stay on the fringe of this Big 12 race. West Virginia’s Logan Routt was kicked out of Monday’s game for tripping Texas Tech’s Matt Mooney while he was sitting on the bench. I wrote extensively in my Monday piece that I thought it was hard to determine whether there was intent to do it and, frankly, whether the positioning of Mooney’s feet might have had something to do with it. 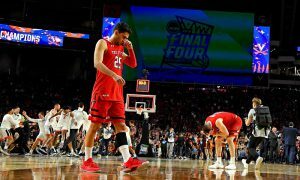 Either way, the refs threw Routt out and it left a sour taste in everyone’s mouths in Lubbock. The Sooners went 0-2 for the week and are now creeping close to the bottom of this conference. There is talent on this team but it’s not coming together right now. 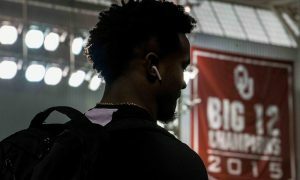 As of last week the Sooners were still considered a NCAA Tournament team. I would imagine they’ll find themselves on the bubble starting this week. At this point, if they keep this up, they’ll get an NIT bid and nothing more. It must be frustrating for head coach Lon Kruger and the Sooners. Everything he’s tried to stop the bleeding doesn’t seem to be working. 20-point games: Ochai Agbaji, Kansas, 23 (vs. Oklahoma State, Feb. 9); Yor Anei, Oklahoma State, 20 (vs. TCU, Feb. 6); Desmond Bane, TCU, 26 (vs. Oklahoma State, Feb. 6); Derek Culver, West Virginia, 23 (vs. Texas Tech, Feb. 4); Kendric Davis, TCU, 22 (vs. Iowa State, Feb. 9); Dedric Lawson, Kansas, 25 (vs. Oklahoma State, Feb. 9); Cam McGriff, Oklahoma State, 22 (vs. Kansas Feb. 9); Kerwin Roach II, Texas, 21 (vs. Baylor, Feb. 6); Marial Shayok, Iowa State, 24 (vs. TCU, Feb. 9); Kamau Stokes, Kansas State, 20 (vs. Baylor, Feb. 9). 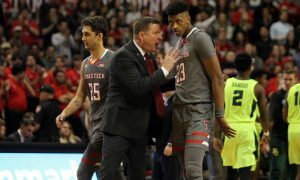 10-rebound games: Derek Culver, West Virginia, 12 (vs. Texas Tech, Feb. 4), 11 (vs. Texas, Feb. 9); Brady Manek, Oklahoma, 11 (vs. Texas Tech, Feb. 9); Norense Odiase, Texas Tech, 10 (vs. West Virginia, Feb. 4), 11 (vs. Oklahoma, Feb. 9); Dylan Osetkowski, Texas, 10 (vs. West Virginia, Feb. 9). 5-assist games: Barry Brown Jr., Kansas State, 5 (vs. Kansas, Feb. 5), 6 (vs. Baylor, Feb. 9); Jared Butler, Baylor, 6 (vs. Texas, Feb. 6); Matt Coleman III, Texas, 5 (vs. Baylor, Feb. 6), 5 (vs. West Virginia, Feb. 9); Devon Doston, Kansas, 5 (vs. Kansas State, Feb. 5); Kyler Edwards, Texas Tech, 6 (vs. Oklahoma, Feb. 9); Dedric Lawson, Kansas, 5 (Feb. 6); Isaac Likekele, Oklahoma State, 7 (vs. TCU, Feb. 6), 6 (vs. Kansas, Feb. 9); Matt Mooney, Texas Tech, 5 (vs. West Virginia, Feb. 4); Alex Robinson, TCU, 11 (vs. Oklahoma State, Feb. 6), 5 (vs. Iowa State, Feb. 9); Marial Shayok, Iowa State, 5 (vs. Oklahoma, Feb. 4); Dean Wade, Kansas State, 5 (vs. Kansas, Feb. 5); Lindy Waters III, Oklahoma State, 5 (vs. TCU, Feb. 6). 4-block games: Tariq Owens, Texas Tech, 4 (vs. Oklahoma, Feb. 9); Kevin Samuel, TCU, 4 (vs. Oklahoma State, Feb. 6), 5 (vs. Iowa State, Feb. 9). 4-steal games: Jamal Bieniemy, Oklahoma, 4 (vs. Texas Tech, Feb. 9); Isaac Likekele, Oklahoma State, 4 (vs. TCU, Feb. 6); Matt Mooney, Texas Tech, 4 (vs. West Virginia, Feb. 4), 4 (vs. Oklahoma, Feb. 9). Double-doubles: Derek Culver, West Virginia, 23 points, 12 rebounds (vs. Texas Tech, Feb. 4); Brady Manek, Oklahoma, 11 points, 11 rebounds (vs. Texas Tech, Feb. 9)Alex Robinson, TCU, 10 points, 11 assists (vs. Oklahoma State, Feb. 6).